staple in America’s recycling diet. About 93 percent of all curbside programs and 82 percent of all drop-off programs in the United States accept them for recycling. As a result, in just eight years, the steel can recycling rate has rocketed from an estimated 15 percent in 1988 to nearly 56 percent in 1995. Among the reasons: steel cans quickly adapted to the recycling infrastructure for all steel products. Ferrous scrap processors were well-prepared to handle and process steel can scrap to end market specifications, and steel mills increasingly ate them up s low-cost, high-quality alternative scrap resource. Steel can scrap use has increased nearly every year since 1988,k and end market use in the United States mushroomed from five mills to more than 80 in the same time frame. 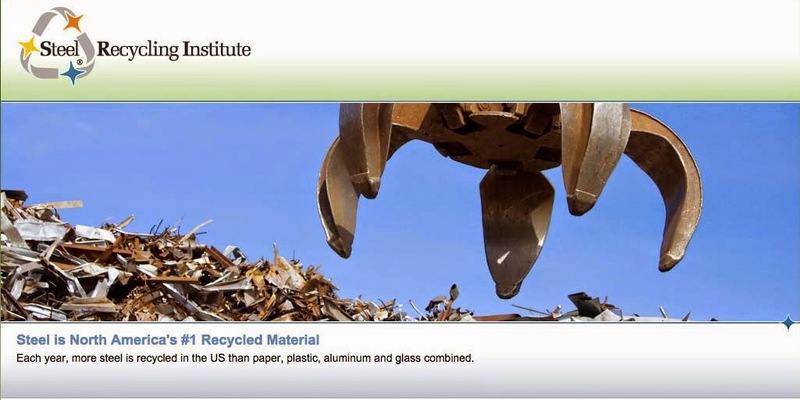 But as much success as the United States has experienced with steel can recycling, it is far from alone in the steel can recycling effort. In fact, the United States isn’t even the global leader of the pack. In 1995, an estimated 73.8 percent of all steel cans were recycled in Japan, according to the Japan Used Can Treatment Association. More than one million tons of steel cans ere consumed in its fiery steel mill furnaces. In the Netherlands, approximately 65 percent of all steel cans were recycled in 1995. The aim of the Dutch packaging chain is to achieve an 80 percent or higher recycling rate by 2001. According to industry officials, steel cans are on target to hit an 86 percent recycling rate by that time. Of all the steel cans marketed in France in 1995, approximately 40 percent were collected and recycled. This was the result of close cooperation of all the players in the steel packaging industry. Steel cans are collected throughout the country by curbside collection and through magnetic separation at resource recovery facilities. In South Africa, a can recovery company called Collect-A-Can was formed to recover steel cans for recycling. Collect-A-Can’s 11 depots and 16,000 collectors accept all types of steel cans, including food, beverage, paint and aerosol cans. An estimated 44 percent were recycled in South Africa in 1995.In province of Ontario, Canada, about 74 percent of all steel cans were recycled in 1995. Enough steel cans have been recycled in Canada since 1985 to fill the interior of Toronto’s Sky dome, home to the Toronto Bluejays of Major League Baseball. Steel can recycling has spread to all corners of the globe. Australia, Belgium, Germany, South Korea, Spain and the United Kingdom also all posted recycling rates between 11 and 67 percent in 1995.
supplies tighten, melters have discovered that steel cans help alleviate this demand. Steel food, beverage, paint and aerosol cans have proven to be a quality form of scrap for the making of new steel. Their remarkable growth and acceptance in the worldwide scrap market should be considered one of the steel industry’s greatest success stories.